Ugh. At least baseball season is looking up. I've spent the last few weeks constantly talking about the Celtics toughness, and last night's game was a perfect example. I've also been saying for quite a while that Rajon Rondo can shoot the ball; perhaps now the world will believe me. Shortly after the game my dad texted me: "That performance tonight by Rondo may have been the most amazing sports effort I have ever seen. Wow." And as it turns out, statistically it was one of the greatest playoff games anyone has ever had. 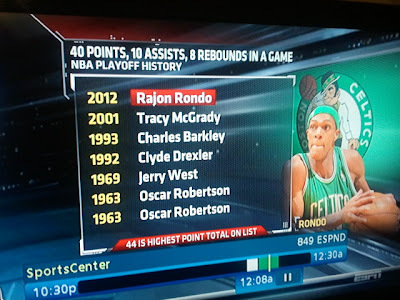 Rondo became the first player in NBA history to record 44 points, 10 assists, and 8 rebounds in a playoff game. Not to mention he played all 53 minutes, and had enough left in him to make every shot he took in OT (scoring all 12 of Boston's points), except for the one where he got hit in the face. 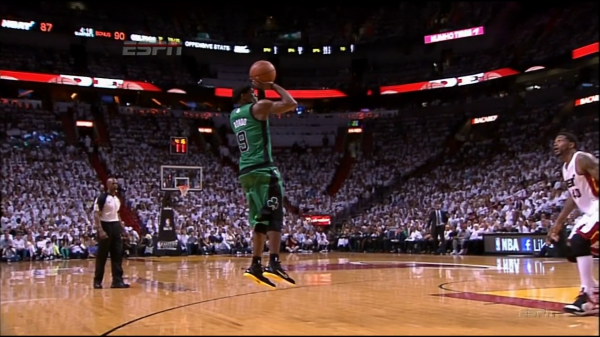 The fact the his effort didn't result in a Celtics victory is just sad. There's no other way to describe it. I'm not going to try to asses blame, or figure out why they didn't win. I'll just say that the C's played their hearts out, and it should have ended differently. I've noticed he often tends to dunk the ball unnecessarily hard; seemingly in some sort bizarre effort to prove to everyone how great he is, and on this occasion it made him look like a chump. I also discovered an incredible nickname for LBJ on twitter last night. On the bright side, the local baseball team has made up 3 games in 3 days on the A.L. East co-leaders, Baltimore and Tampa. The last place Red Sox are just 2.5 games out of first. Yes, you read that right. They're now 26-24, and only one game back of the Wild Card as well. Abraham Lincoln killed vampires. No big deal.